We'll start with websites that focus on SQL syntax and basic SQL concepts. Vertabelo Academy offers interactive SQL and SQL Server courses, available directly in the browser. Among standard SQL courses, you can learn about SQL queries, data management, and table creation and more advanced like SQL JOINs and Window Functions. 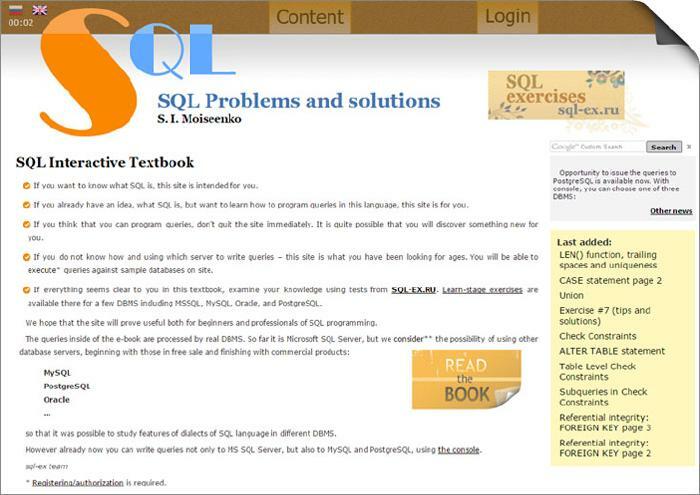 Recursive Queries, Standard SQL Functions and SQL Practice Set to test your SQL Basics skills. You find also similar courses to SQL Server. 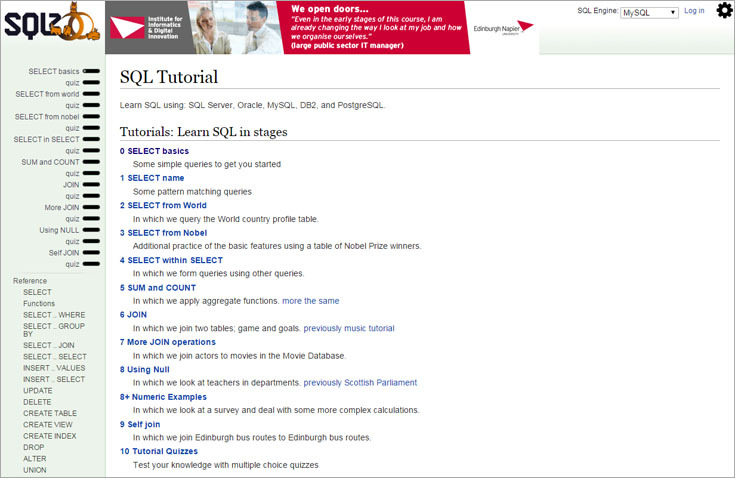 Check out how to learn SQL. The "SQL Basics" course starts with simple queries, progressing through GROUP BY queries to advanced topics like subqueries. You will also find out about the subtle changes between various joining methods, including INNER JOIN, LEFT JOIN, RIGHT JOIN and OUTER JOIN. Finally, you'll have a chance to test your knowledge in a comprehensive quiz. In the "Operating on Data in SQL" course, you will learn how to manage data in relational databases, i.e., how to insert, update, and delete information from a database. In the "Creating Tables in SQL" course, you will find out how to manage the structure of a relational database. You'll learn to create tables and define their various elements, like primary keys, UNIQUE keys, and foreign keys. You will get to know how to use and define constraints. Finally, you will find out how to create views. Each course features dozens of interactive exercises with a detailed explanation of the theory behind the lesson, and an interactive console that verifies your solution. After completing all lessons, you can take a final quiz to test your knowledge. You can start the course without registration but you will be asked to sign up after completing the first few exercises. You can register with your email address, or your social profiles (Facebook, Google+, Twitter, or GitHub). 2. W3Schools - "SQL Tutorial"
Their online SQL Tutorial guides you through syntax and most important statements, keywords, and functions. Short but concrete descriptions and many examples make this tutorial easy to read and understand. A distinctive feature is the ability to test queries online. At the start of the tutorial, there is a sample database which you can modify and restore back to its original content at any time. The guide ends with a simple quiz. The entire tutorial is available without registration. 3. 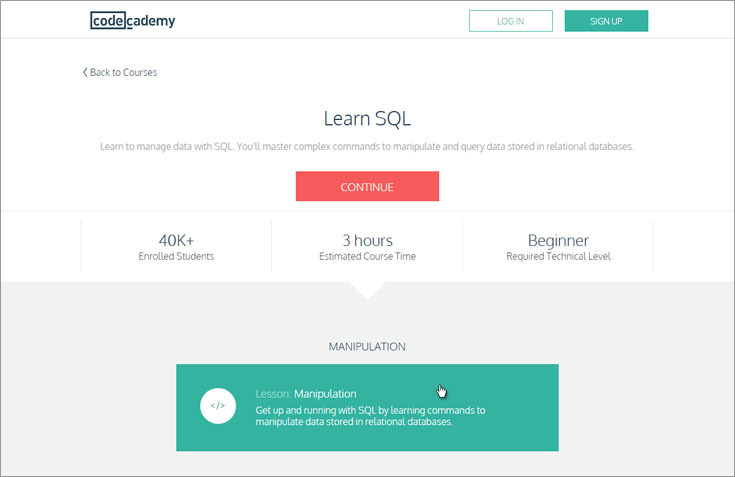 Codecademy - "Learn SQL"
Like all other courses at Codecademy, "Learn SQL" is free and interactive. It covers the basics of database fundamentals: tables, queries, aggregate functions, constructing advanced database queries and more. The user interface of each lesson is divided into three panels. The left one contains a description of the exercise with a brief theoretical introduction. In the center, there's an interactive SQL command line where the user writes SQL against an SQLite database. 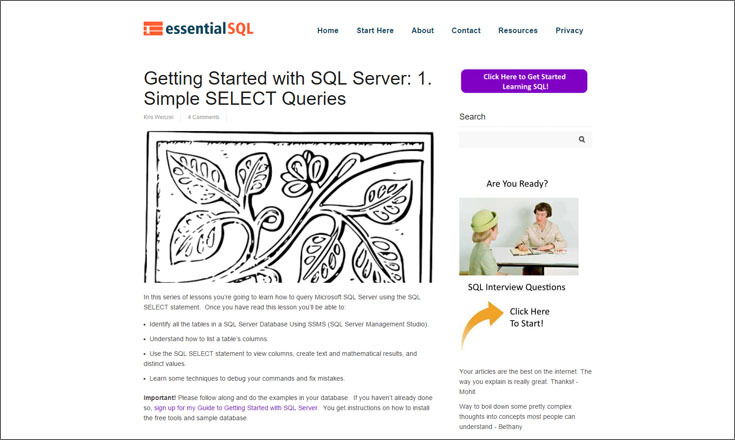 The panel on the right features a visual representation of the database schema with the query result. 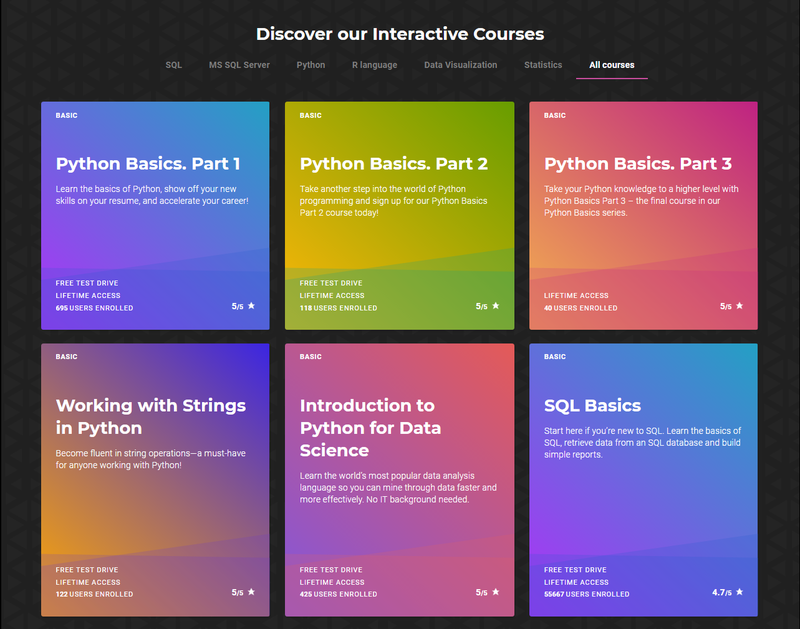 After completing a lesson, you can test your knowledge with a quiz, or master your skills with a real-world project to teach you how to apply what you're learning sql in a hands-on, practical best way. Unfortunately, both quizzes and projects are available only for users who have subscribed to a paid Pro version of Codecademy. In order to participate in the course, you need to register using an email address or a Google or Facebook account. 4. 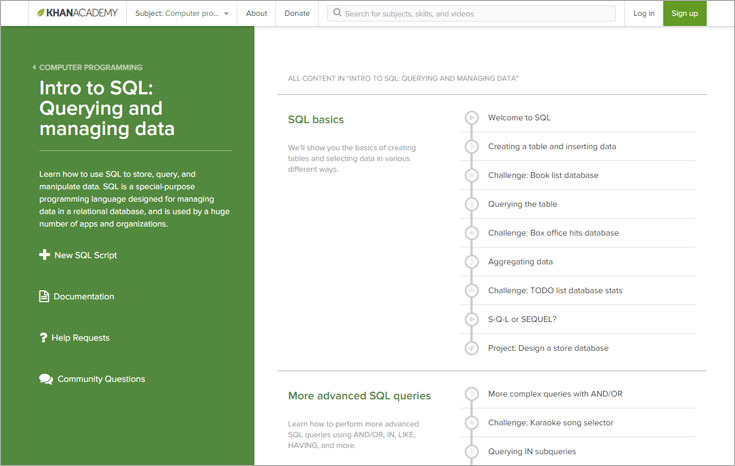 Khan Academy - "Intro to SQL"
Among many courses offered by Khan Academy, you can find a free SQL course called "Intro to SQL: Querying and Managing Data." Each lesson consists of two elements. The window on the left is a video tutorial, while the window on the right shows real-time changes in the database structure and the results of queries performed under the SQLite database. Exercises are supported by documentation and useful hints. After finishing the first part of the course, learners complete a more advanced project. The whole course contains 5 parts, starting with SQL fundamentals. It continues with constructing more advanced SQL queries using operators (such as AND/OR, IN, LIKE, etc.) and joins. An ending section called "What to learn next" provides useful tips and links. Khan Academy allows users to watch videos without registering; however, after registration (via Facebook, Google, or email) they can ask questions regarding videos and participate in discussions. The course features live interpreters and interactive exercises for multiple types of databases, such as MySQL, PostgreSQL, Oracle, and SQL Server. This site has three major sections: Tutorials, Assessments, and Reference. A tutorial is a set of exercises that aims to acquaint you with new topics. You start with SQL basics, then go through nested SELECT statements and aggregate functions (such as COUNT, SUM, or AVG), ending with more advanced JOIN operations. At any time, you can consult the Reference section for background on the appropriate theory, explained with interactive examples. After completing each tutorial, you can take a quiz to show how well you understand the topic. The Assessments section offers several mini projects; each includes 15 questions of varying levels of difficulty. The course is available without registration, however, you can create an account with your email. This is recommended if you want to publish comments or contribute to the site. 6. 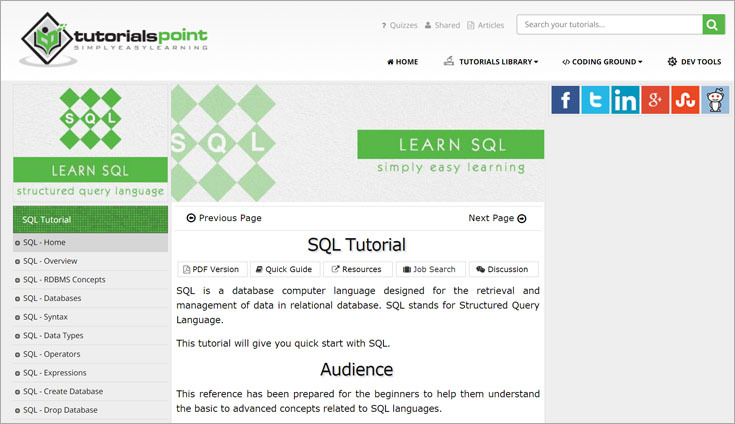 Tutorialspoint - "Learn SQL"
Tutorialspoint claims to be the web's largest library of tutorials. Indeed, it offers dozens of SQL online courses in computer engineering, information technology, programming languages, and management. If you’re looking to learn SQL or database concepts, you will find several tutorials here, including courses on SQL, MySQL, PostgreSQL, SQLite, DB2, PL/SQL, and others.. The "Learn SQL" tutorial provides a nice guide to basic SQL, its most useful functions, and more advanced topics. There are plenty of easy-to-understand examples, but no interactive exercises to practice what you have learned. All courses available at Tutorialspoint.com, including the "Learn SQL" tutorial, can be accessed without registration. It's worth mentioning that you can download the whole tutorial as a PDF file to get back to it at any time, even when offline. 7. 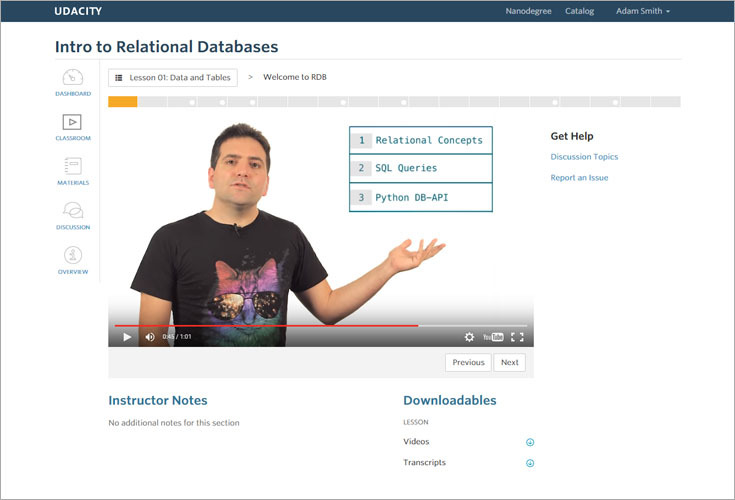 Udacity - "Intro to Relational Databases"
Udacity offers interactive SQL online courses aimed at advancing academic and vocational skills. Although Udacity is profit-oriented, some courses are available for free. One of its free courses is "Intro to Relational Databases", which provides the learner with the basics of SQL and database design. Since the course uses examples and programming exercises in Python, you'll also get to know the Python API. For this reason, Python fundamentals are required. You don't need any previous database experience since this course is an entry-level introduction to relational databases. The course ends with a project that focuses on building a database-backed Python module to run a game tournament. You don't have to register to preview the course, but if you want to get full access, you must sign up with your email, Google, or Facebook account. 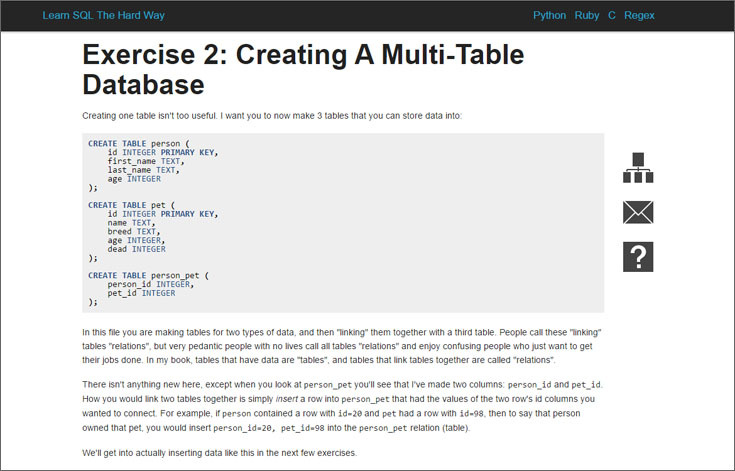 Once you get familiar with SQL, you can practice your skills on the sister site "SQL Exercises". Here you can build and test your SQL DML statements: there are exercises for retrieving and modifying data using the SELECT, INSERT, UPDATE, and DELETE statements. You can read the entire textbook without registration, but if you'd like to write your own queries in the interactive SQL console and execute them against sample databases, you'll need to sign up with your email address. The tutorial presents free tools to get you started, a guide leading you through the setup process, step-by-step explanations of how to download and activate a sample database, and much more. You'll get to know how to create simple select and sort queries, introduce yourself to SQL Server's built-in function, learn how to normalize your database, and much more. An especially great thing with Essential SQL is that Kris is personally involved in the teaching process. When there are problems or doubts, he strongly encourages readers to contact him. A significant drawback of this course is its lack of a structured learning program. It's more an extensive collection of articles covering a wide range of SQL-related topics than a step-by-step tutorial. Most of the articles are available without registration; however, some content requires users to sign up with an email account. The essence of this course is perfectly described by the following review: "This book will teach you the 80% of SQL you probably need to use it effectively, and will mix in concepts in data modeling at the same time." Indeed, the tutorial looks much more like a story, where each chapter has some theoretical content, related questions, and exercises. You can learn the basics of creating and manipulating tables, get familiar with data migration, and start understanding data manipulation and transactions. To keep the book simple, the site uses SQLite3 to teach you how to design data and work with it. Right now, there's an HTML ALPHA version of the book available, so users will have to wait for the final chapters to be completed. The entire contents of the website is available without registration. Udemy is a leading global platform where experts create courses and offer them to the public, either at no charge or for a tuition fee. 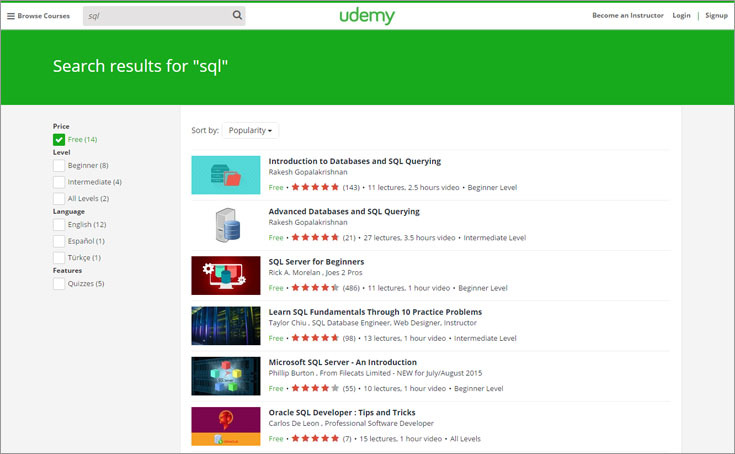 Udemy provides various database and SQL video courses designed for particular database engines, including MySQL, Oracle, and MS SQL Server. There are several free SQL courses for both beginners and advanced users. To start SQL learning, you must register with your email address. SoloLearn is an online SQL training platform that offers a variety of free courses on programming languages. One of their courses is SQL Fundamentals - a great resource for fast, effective, and fun SQL tutorials. Based on the MySQL database, the SQL Fundamentals course covers the basics of database fundamentals such as query syntax, filtering records, aggregate functions, and joining tables, even teaching more advanced concepts like subqueries, set operations, and views. The course not only covers the basic SELECT statement but also the UPDATE, DELETE, INSERT, and ALTER statements. The lessons are short but focused, allowing you to stay on target to finish the course in a relatively short period of time. Each module is followed by an interactive quiz, and the last module presents a summary with two challenges. You don't have to install any database server on your own machine to answer the questions or work through the interactive problems. Delivered through a convenient and user-friendly platform, the Fundamentals course allows you to learn SQL at your own pace and from any device, such as your PC, tablet, or smartphone. While the course is free, it does require registration, though the process is very simple. Once you complete the course, you'll even get a free certificate to showcase your achievement! This website provides users with a set of tutorials on managing MySQL databases and manipulate data. With various techniques - such as SQL queries, MySQL stored procedures, database views, triggers, and more - the tutorials shows how to deal with common tasks in MySQL. 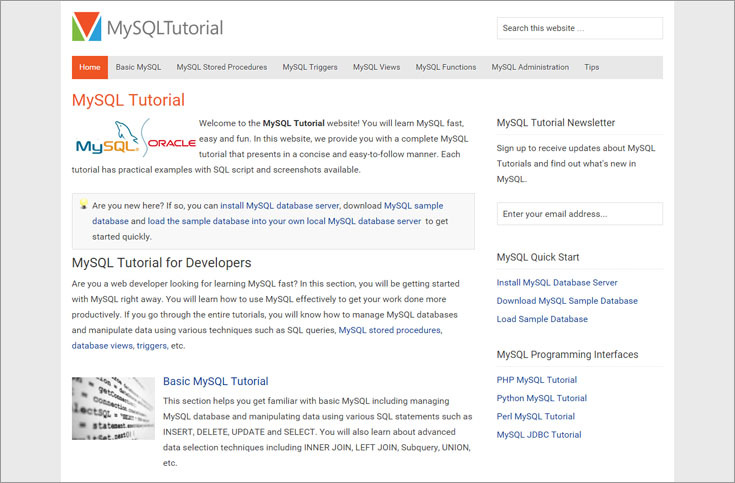 The Basic MySQL tutorial helps you get familiar with the fundamentals, including managing databases, creating tables, querying and modifying data using various MySQL statements and other constructs. Lessons also contain example queries that you can run and observe. In the MySQL Tips section, users are provided with advanced techniques and tips to help them solve the most difficult challenges in MySQL effectively. All tutorials are available without registration. 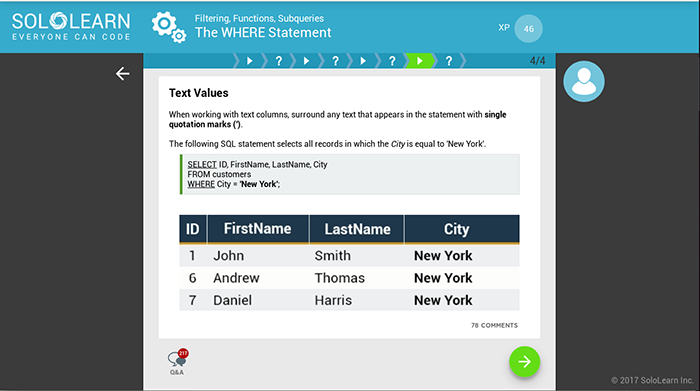 SQLCourse provides easy-to-understand SQL instructions and allows you to practice what you learn with an on-line interpreter. With these tools, you can create your own unique tables and perform selects, inserts, updates, deletes, and drops - in other words, you'll learn the basics of SQL by doing it yourself. When you complete the basic training, you can continue developing your SQL skills with SQLCourse2. This course gives you an introduction to important advanced features and clauses of the SELECT statement that weren't supported in the previous part. The resources of both websites, SQLCourse and SQLCourse2, are available without registration, however, you can sign up with your email to get free access to newsletters, whitepapers, and other premium contents. The site related to SQLCourse and SQLCourse2. Although it looks old-fashioned, Database Journal is a great comprehensive source of knowledge. 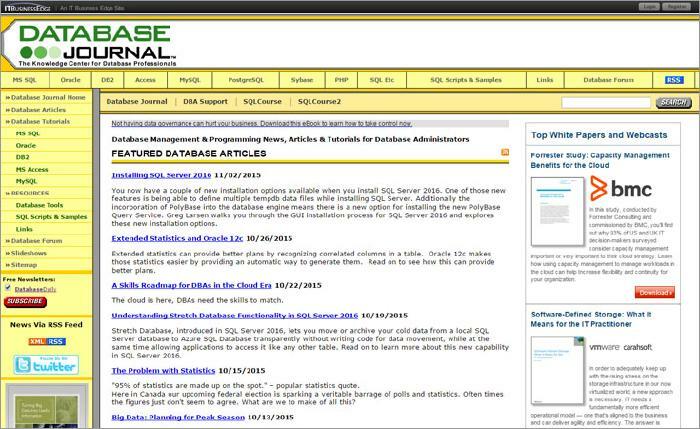 There are lots of database articles, news pieces, and tutorials regarding MS SQL, Oracle, DB2, MS Access, and MySQL database management systems. You don't have to register to take advantages of this website, but you can sign up with your email to get free access to newsletters, whitepapers, and other premium contents. Guru99 has a wealth of tutorials on a wide variety of subjects. Some of the tutorials are written, while others are video-based. As far as SQL, the Guru99 website offers “SQL Tutorial for Beginners Learn in 7 Days”, which teaches SQL from the basics, such as the fundamentals of the SQL language, to more advanced techniques like joining tables, set operations, and subqueries. It is not an interactive course (it has no SQL Console), but it is an interesting resource for learning SQL. This website offers also others SQL courses for PL/SQL and SQLite. This SQL Tutorial is based on the MySQL database server. On the tutorial’s main website you’ll find the table of contents. The topics in respective sections are explained clearly and precisely. In addition to the section text, diagrams and funny pictures help to explain the material in an easy and accessible manner. 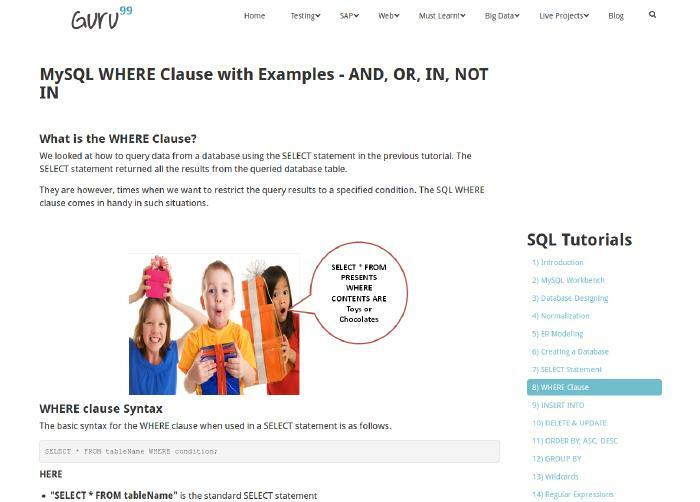 In each section you’ll also find query syntax and examples. Sections conclude with a short summary, and you can also take an SQL Quiz to test your acquired knowledge. All of Guru99’s educational tutorials are free, and they don't even require registration. The following resources cover database fundamentals and usage. 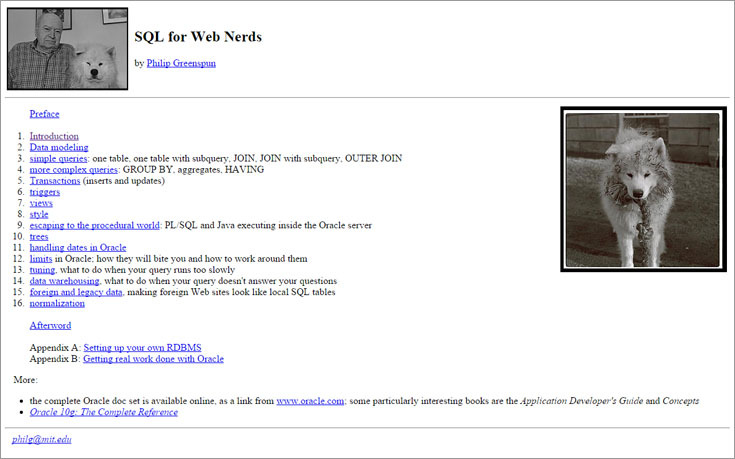 "SQL for Web Nerds" is a free online book written and distributed by MIT professor Philip Greenspun. Some of you may be familiar with this book, since it's required reading for many university database classes. "SQL for Web Nerds" teaches relational database management systems from the perspective of a web application developer rather than from a theoretical point of view. It covers basic database concepts such as ACID and how RDBMS work; provides examples of simple and complex queries, transactions, triggers, and views; and tackles issues like having Java executing inside an Oracle Server, handling foreign and legacy data, and normalization. Note: The SQL examples given in the book are for the Oracle database. All of this is presented in a light way, with well-thought-out examples. Photographs illustrating the author's concepts enrich the tutorial. The entire website is available without registration. This course covers database design and the use of database management systems for applications. It's where you can find self-paced mini-courses or one collective "Introduction to Databases" course that contains all mini-courses and a no-SQL review. Courses are taught by Professor Jennifer Widom, co-author of four academic books covering beginning and advanced introductions to database systems. In brief, these courses cover: Introduction to relational databases, Querying Relational Databases and XML Databases; Database Design; and SQL Advanced Features. 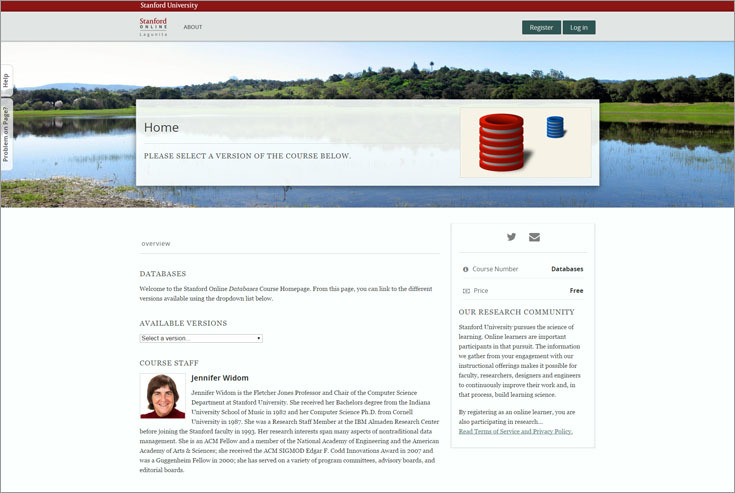 The Stanford Database Course has four major elements: Courseware, Readings, Discussion Forum, andWiki. The main materials are found under Courseware: surveys, video lectures with transcripts, quizzes, and exercises. Suggested supplementary readings and other pointers are found under Readings. If you want to enroll the course, you must register for an account in the Stanford online learning system. The following resources focus on learning through fun. Who said that the learning process has to be completely based on tutorials? It could also be fun! So if you are keen on computer games and want to learn SQL, this one is definitely for you. 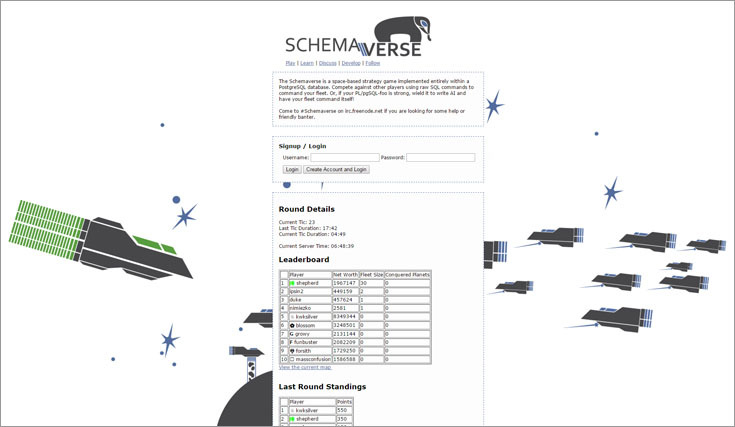 Briefly, Schemaverse is a space-based strategy game implemented entirely within a PostgreSQL database. Players start on their home planets, where they can build new spaceships and mine resources that can be used to create or upgrade additional spaceships. After completing their own fleet, they can expand across the universe and conquer planets belonging to other players. To command their fleet and compete against others, the gamers must use raw SQL statements. It's not only beginners who can find something here. Indeed, some more advanced in PostgreSQL will definitely enjoy playing Schemaverse. As a result, the gamer will not only be fluent in basic SQL, but they'll also get acquainted with PL/pgSQL. To participate in the game, you must sign up with your email. Ready for another fun approach to learning? This one is a galaxy manipulation application, where you can run queries against galaxy database model created in SQLite. The course provides a virtual teacher, Professor Alfred T. Guru, who introduces you to basic SQL syntax. 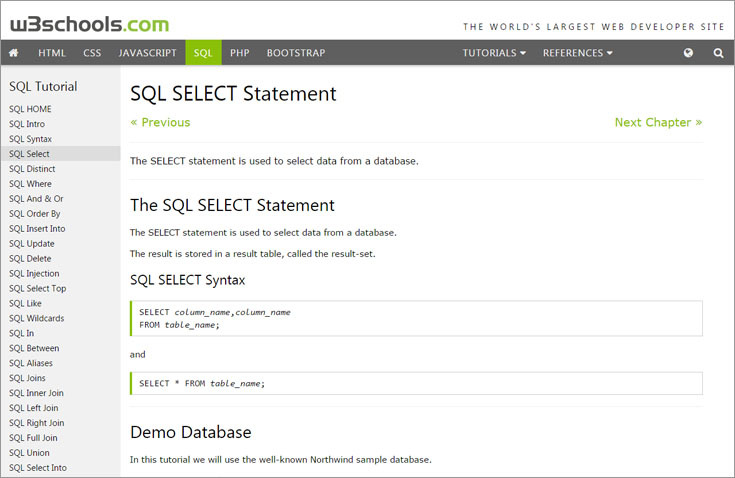 The course starts with an explanation of SELECT statement, goes on through transactions, and ends with indexes. Each chapter, along with a detailed explanation, contains an exercise that puts the theory into practice. 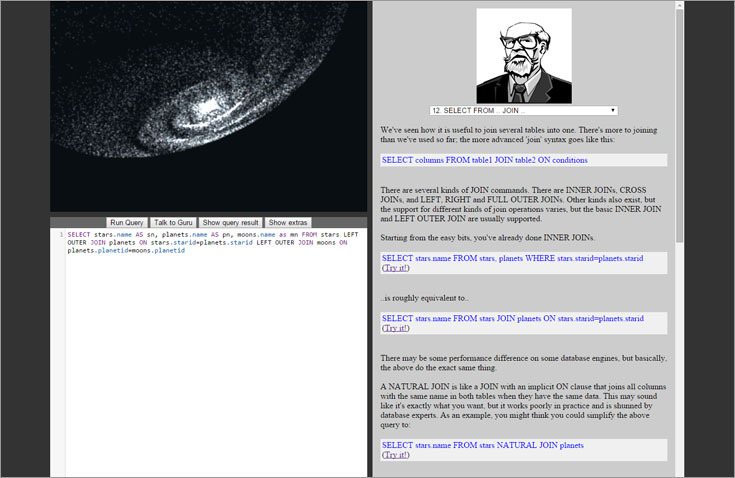 Basically, the exercise relies on writing an SQL query in the editor below the galaxy map. After completing the task, the user gets the query results or, in case of errors, receives helpful, human-readable error messages. In addition to online course, there are downloadable desktop versions available for Windows, OS X, and Linux. The tutorial is available without registration. Following are links to online documentation for some databases. SQLfiddle is the perfect tool to test queries, compare and contrast SQL statements in different database back-ends, or when you don't have a particular database platform readily available but would like to see what a given query would look like in that environment. 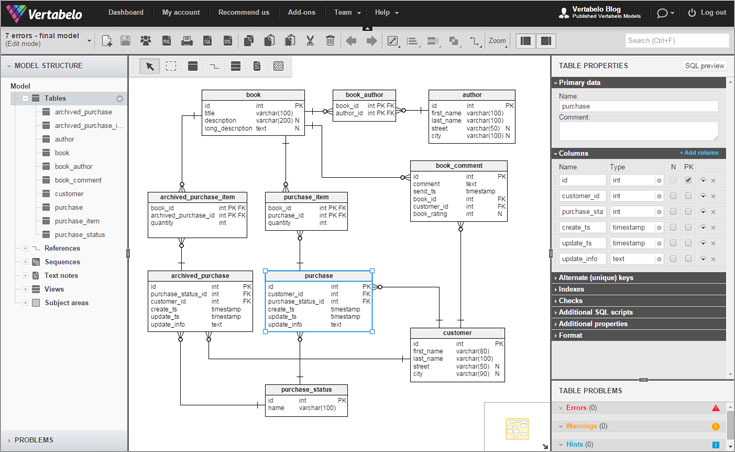 Vertabelo allows you to design your database structure for most popular database engines, including PostgreSQL, MySQL, Oracle, SQL Server, SQlite, and IBM DB2. Here, you can put into practise what you learned about database modeling concepts. At any time you can generate an SQL script that creates/removes all elements in your database or removes the selected elements/constraints. Vertabelo checks your model before SQL script generation and notifies you of any errors or warnings. 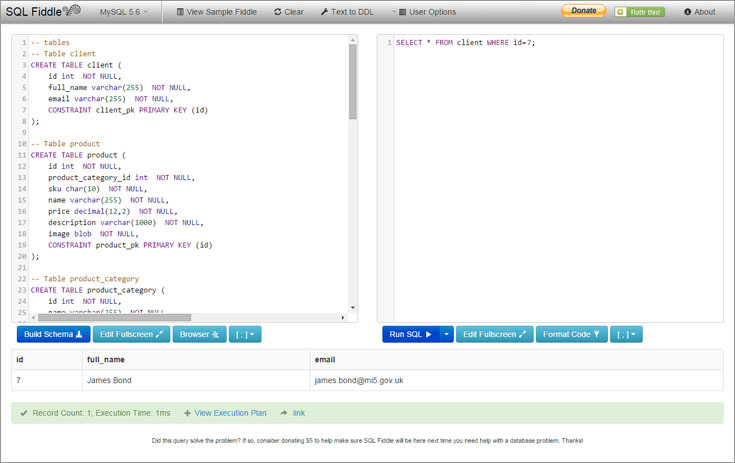 You can run the script in a particular database or in SQLfiddle and play with it there. Note that Vertabelo offers free academic accounts for students and lecturers learning or teaching database design. To register such an account, you must provide your academic email address, i.e., the address with your educational institution's domain. Click here to sign up for an academic account. Here you have a sample interactive database model created in Vertabelo. If you'd like to try out how it is to model a database online, just click the "Edit model" button. It's free and no registration is required.